This guide will walk through the steps required to build a simple Fulcrum email notification system using the Google Apps Script platform in conjunction with Fulcrum webhooks. The resulting system will send out email notifications any time a record is created, updated, or deleted in our designated Fulcrum app. Subject: The subject line containing the event type (create, update, delete). User: The user who created, updated, or deleted the record. Record Title: The title of the record (can be any field you choose). Record ID: The unique ID of the record, linked to the record view/edit screen in Fulcrum. Timestamp: The Fulcrum updated at timestamp (when the record was updated). 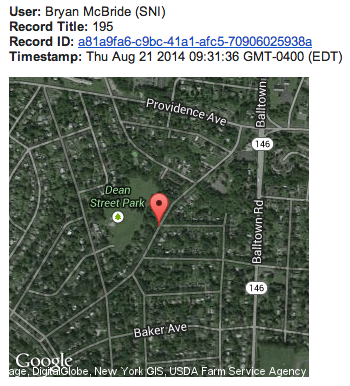 Static Map: A Google Static Map image showing the location of the record. In order to limit the email notifications to a specific app, we need to specify the ID for the app that you will get notifications for. You can easily find the ID for your app in the URL of the app dashboard. Copy everything after https://web.fulcrumapp.com/apps/ in the dashboard URL- this is your form ID. Next, in order to grab information for particular fields that are unique to your app, we need to take a look at the form definition. You can view the form definition by making a simple call to the Forms API directly in your web browser. You will need your API key for this, so click on the red gear icon in the upper right-hand corner of the Fulcrum screen to access your settings. Click on the API Key button under your organization and copy the API Key. In the returned form definition JSON file, search for the record_title_key and copy the value. If you want to display additional information in your email notification, make note of the key values that match up with the labels corresponding to the fields you created in the app builder. Now that we have the information we need from Fulcrum, we can begin writing the Google Apps Script, which will ultimately provide our webhook endpoint. 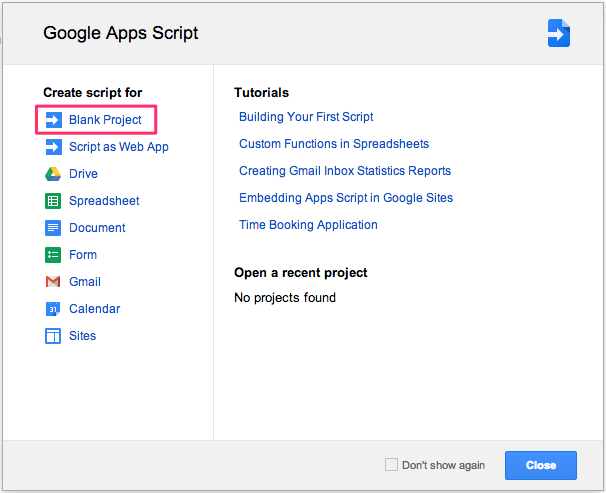 Visit https://script.google.com and click to Create a script for a Blank Project. Our script is going to intercept the webhook record event JSON payload, pull out the data we want, construct and send the email from our Google account. Copy the following script into the Apps Script browser editor, making sure to clear out any existing code. The doPost function intercepts our JSON payload from Fulcrum and passes it to the handleResponse function. Update the formId and title variables with the information you copied earlier. Update the sendTo variable with the email address to send to. You can modify the script to add attachments, bcc addresses, etc. by setting advanced MailApp parameters. The script should be fairly self-explanatory and easily customizable. Once we deploy the script, we will be given a web app URL to use in Fulcrum. Make sure to save the script then click Publish -> Deploy as web app. You can give a description for the Project version (click Save New Version) then set Execute the app as: me (your email) and Who has access to the app: Anyone, even anonymous. Click Deploy and be sure to copy the web app URL. Note- if you make any changes after initially deploying the web app, you will need to save a new version before re-publishing. Click File > Manage versions to save a new version and select the latest version when you deploy. We now have a URL endpoint to intercept our webhook payload and fire off an email notification. From the Fulcrum settings page, click the API Webhooks button then click to Add Webhook. Webhooks are global to a Fulcrum organization, so be sure to give it a meaningful name so that you will know which app the webhook references. Hopefully, this guide demonstrates the power of utilizing Google Apps Script to process Fulcrum webhooks. This is by no means limited to email notifications. This same setup could also be used to insert Fulcrum data into a Google Sheet, Fusion Table, or forward it to another REST API. GAS web apps can also be utilized as proxies to interact with the Fulcrum API without exposing your API key to the public.